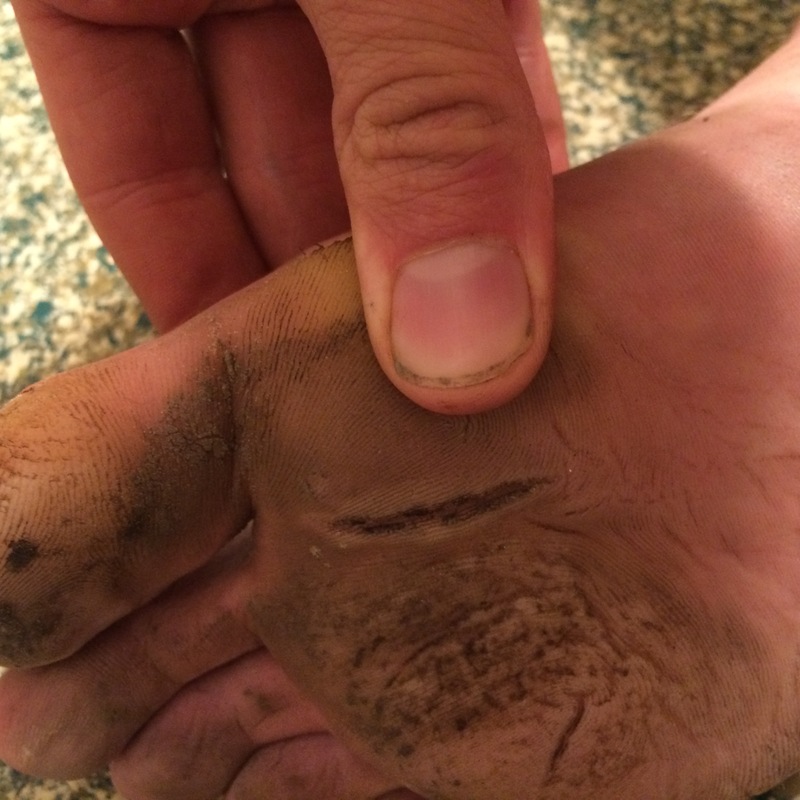 In the first two articles in this (likely 10+) part series I talked about the cause of, prevention of, and triage of, blisters, and lost toenails. By far the most prevalent issue that affects performance due to incurred pain, is that of blisters. Just as painful, less likely, and therefore harder to develop a strategy around is maceration. Maceration occurs when the skin painfully folds over on itself, and when those folds can cause significant pain within the fold on the (now sensitive) skin. Maceration begins when the natural pliability and strength of the skin at the bottom of the foot is softened by excessive and continuous moisture. It is exacerbated, in my opinion, by excess callused/hard skin. The second component of maceration, once the skin is softened, are sheer forces on the surface of your skin. If you recall high school physics, you will recall that a sheer force occurs when a lateral force exists across two surfaces, or when a lateral force is applied to a material. In the case of foot maceration, the sheer force placed on the (moisture softened) skin, comes from the angle of the foot, and gravity, doing their thing as you ascend or descend on steep terrain. So knowing that maceration is basically painful folds in the skin that was softened by moisture, we can unravel the causes. Obviously the first contributing factor is softening and deterioration of the skin due to moisture. The folding occurs when the pressure on the foot is such that a pull is exerted on the skin, which eventually causes portions of the skin to fold over on itself. This pull is caused by too much friction, and too much potential movement of the foot. When descending down a hill, for example, if there is enough play in the movement of the foot within the shoe (and there does not need to be much), what happens is the weight of your body causes the skeletal structure of your foot to pull forward, providing that sheer force on the base. Ascending a hill causes similar forces in reverse. Given the 3 factors that cause maceration, the approach to prevention is to prevent the pull on the skin at the bas of your foot. The most important strategy for this is a properly fitted and laced shoe (see previous posts) and a good sock choice. Additionally some minimal shoes are too soft around the foot to really hold it in place, and so a shoe with more rigidity (or better yet for non-running, mountainous events, a hiking or military style boot) provides better protection from the forces that create maceration. Pre-lubing, and maintaining good coverage, with a product like Trail Toes is also an important strategy for two reasons. The first is that is acts as a moisture barrier, preventing the change in structure to the skin that excessive moisture provides, and secondly it reduces the skin friction – which in turn means that your sock is more likely to slide over the skin rather than pull onto it. Less pull = less folding. While there are other products available, Trail Toes is the best out there to date. Only experience will tell you if you are particularly prone to maceration, but if you find that you are, then pre-taping with Leukotape is a critical strategy. Personally I tend to macerate only on the ball of my foot, so I will (if the race seems arduous for terrain and moisture) sometimes tape in two layers, over the ball of the foot providing a 3″ wide stretched layer of tape, going over the sides of my foot by an inch or two. Do NOT forget to round the corners of the tape. Doing so prevents the tape from catching and lifting from the skin. The only successful triage for maceration is to tape the affected area. Before taping, you will need to prepare the foot. It is likely that your feet need to be dried. For this, I would remove socks, and then liberally coat with foot powder. Make sure that you get into the skin folds that have formed in order to prevent them worsening and to dry out the ridges. Remove as much of the powder as you can – perhaps utilizing an alcohol wipe – before commencing to the next phase. If you do not do this, your tape will not stick properly. If the maceration is particularly bad (large folds, incredibly painful and tender under the folds), I like to coat with a layer of New Skin in the fold. This will harden and protect the skin but might sting like hell at first. After these steps, it is time to tape. I like to tape left-to-right across the base of the foot, making sure that the tape extends a little over the top of the foot, and the corners are rounded. It is ABSOLUTELY imperative that as you tape you stretch out the skin such that the folds disappear. Rub the tape firmly a number of times. The heat from the friction of rubbing helps the tape stick better. Note that Leukotape is the ONLY tape I trust for maceration, as it is the only tape with the rigidity and adhesiveness to prevent the maceration folds from returning. In a pinch, KT Tape or Rock Tape will also work with some success.